Molluscum contagiosum is a common viral infection that affects the skin. Although it can occur at any age it most commonly affects children before the age of 6. In the majority of cases the only symptom of molluscum contagiosum is a number of small 2-5 mm raised papules on the skin. The lesions are very often grouped together in clusters and have a pearly grey color. On top is a flat white spot. If the top ruptures, a thick white-grey substance will be released. Large molluscum contagiosum show the typical dome shape and the yellowish-white substance they contain. What is the cause of these wart-like skin lesions? Molluscum contagiosum is caused by a highly contagious virus known as the molluscum contagiosum virus (MCV). The virus can be spread through skin-to-skin contact with an infected person In adults they are usually more persistent but in a large majority of cases they clear up eventually. It can be spread easily among young children at school. 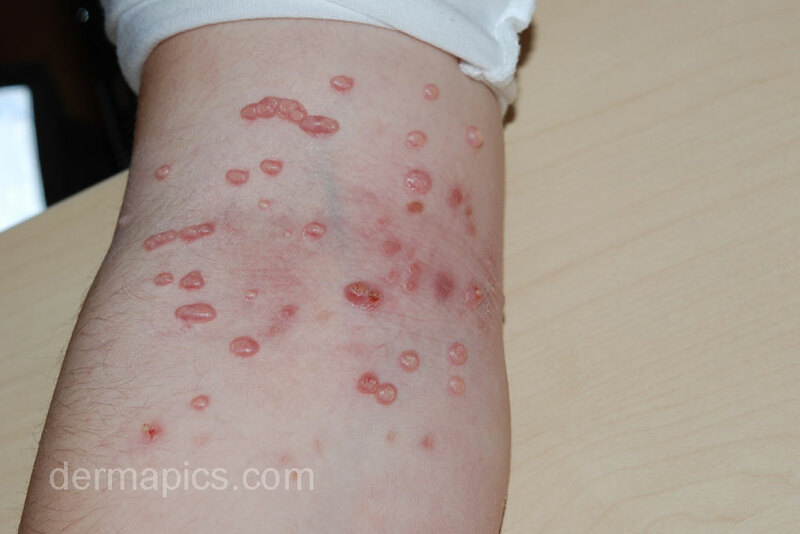 Adults can also develop molluscum contagiosum. In most cases only a single lesion will develop. When adults develop multiple lesions a weakened immune system may be the cause of this. 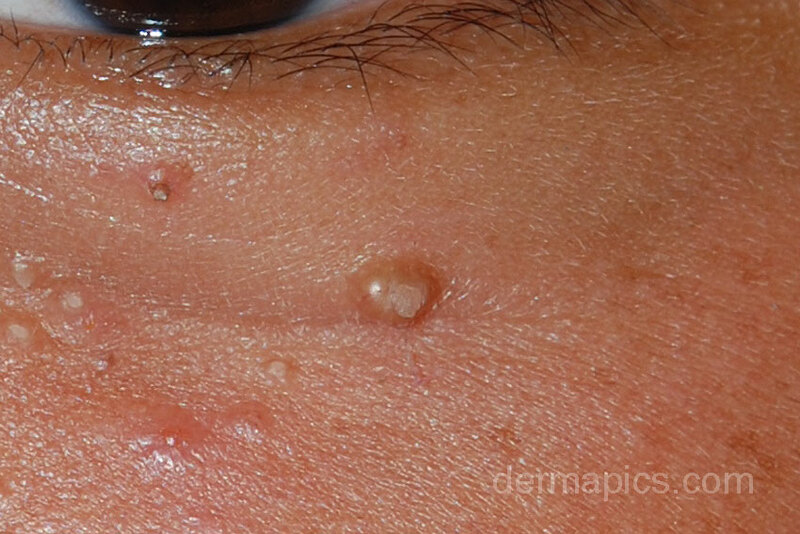 Molluscum contagiosum can also occur in the face. When the lesions are very small, the dome-shape is often not apparent to the naked eye. In healthy children, molluscum contagiosum usually clears up on its own within 18 months. In general, treatment for molluscum contagiosum in children is not recommended. The infection does not usually cause any other symptoms apart from a mild itch and treatment may be painful and may sometimes result in scarring. Do not squeeze spots because this increases the risk spreading the virus. In some cases the skin lesions are treated with application of liquid nitrogen (freezing) or curettage. Other treatments are seldom used. DiBiagio JR et al: Reviewing the use of imiquimod for molluscum contagiosum. Dermatol Online J. 2018 Aug 23;24(6).